Football takes on Mount Snowdon. | News by Wales Express News, People Before Profit! Home Causes and Charities Football takes on Mount Snowdon. Football takes on Mount Snowdon. 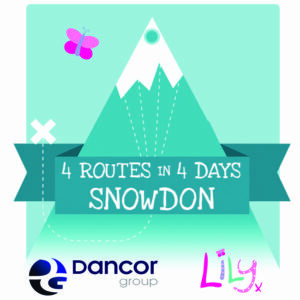 BBC Match of the Day commentator Jonathan Pearce and former Fulham full-back Les Strong will lead the Lily Foundation team climbing Mount Snowdon by four different routes on four different days from May 20 to 23, 2016. Over the four days more than 40 supporters, including those that have been directly affected by the disease, will be slogging 23,611 feet up and down the mountain with Jonathan and Les. Mount Everest is only 29,029 feet! Former West Ham legend and Blackburn Rovers title winner Tony Gale will also be walking for the last two days of the challenge. The Lily Foundation is a charity close to Jonathan’s heart. He is Chairman of the charity founded by his family in memory of his niece Lily who lost her fight with Mitochondrial Disease when she was just eight months old. It’s a genetic condition that prevents cells in the body from producing enough energy for the body to survive. It can affect any part of the body, for example the heart, brain, muscles, eyes, hearing, stomach or kidneys and has no known cure. The Lily Foundation funds research to improve diagnosis and increase treatment options for Mitochondrial Disease, and ultimately find a cure. The charity also raises much needed awareness of the condition and support families affected by Mitochondrial Disease. “Les is a great supporter of the Lily Foundation. It was his wife’s idea to take on Snowdon. What a challenge! It will be quite a task. I will ache in places I didn’t even know could ache. But I’ve run five London Marathons of Lily and I always think that the pain we suffer doing these money-raisers doesn’t even compare to the heart breaking tragedy of losing a child to this awful disease. Please help us beat Mitochondrial Disease!” Is the plea from Jonathan Pearce. They are hoping to raise tens of thousands of pounds for The Lily Foundation through this Challenge and give hope to those affected by Mitochondrial Disease.